Tuscany is so full of wonderful, hidden gems that you’ll find it hard to know where to start. 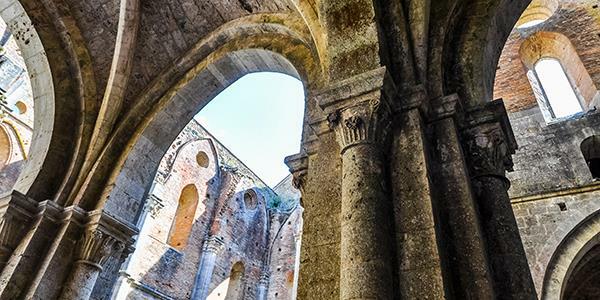 Just half an hour away from Stigliano you’ll come across the beautifully preserved Abbey of San Galgano. Located in the Val de Merse, the monastery is thought to date from the early 13th century and was built by Cistercian monks. Unfortunately for them a famine in 1329 and the plague of 1348 hit the community badly and they were forced to relocate to Siena. As was common practice at the time, the monks built their monastery close to a river. Despite its size, the abbey is not a major tourist trap as it is a little off the beaten track, but it makes for a wonderful little excursion. The large Gothic church is now roofless, but you can see the grandeur with which it once stood and its impressive arches are still all intact. Close by, the Hermitage of Montesiepi sits atop a hill with marvellous views out over the surrounding Tuscan countryside. 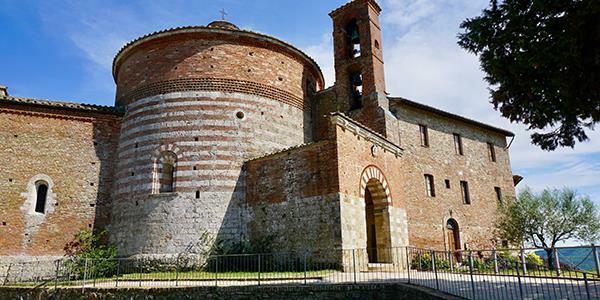 It has an interesting cylindrical church and is sometimes known as ‘The Rotonda’. It is here that San Galgano is buried. The story goes that San Galgano was once a knight who gave up his way of life and worldly possessions to become a hermit. He was guided to Monte Siepi where he thrust his sword into a rock as a symbol of peace. The sword in the stone can still be seen today where it remains on site in the church. It is buried up to its hilt and is now covered by a protective glass case. San Galgano died in 1181 and the hermitage was built over the spot that he had spent his later years. The circular church was joined later by a rectangular chapel and this was decorated with frescos by Sienese painter Ambrogio Lorenzetti. The area is certainly surrounded in myth and mystery and both locations are worth a visit if you are in the area. You can park and walk between the church and the hermitage and there is a little restaurant and shop so you can stop off for a pick-me-up or grab a coffee. Find the abbey off the SP441, half an hour south of Stigliano.